Sometimes, as Republicans, we have to think a little outside the box when it comes to presidential candidates. Right now, the story line is that the most conservative among us must support Ted Cruz, the moderates among us must support Jeb Bush, and the angriest among us must cheer for the unelectable Donald Trump. 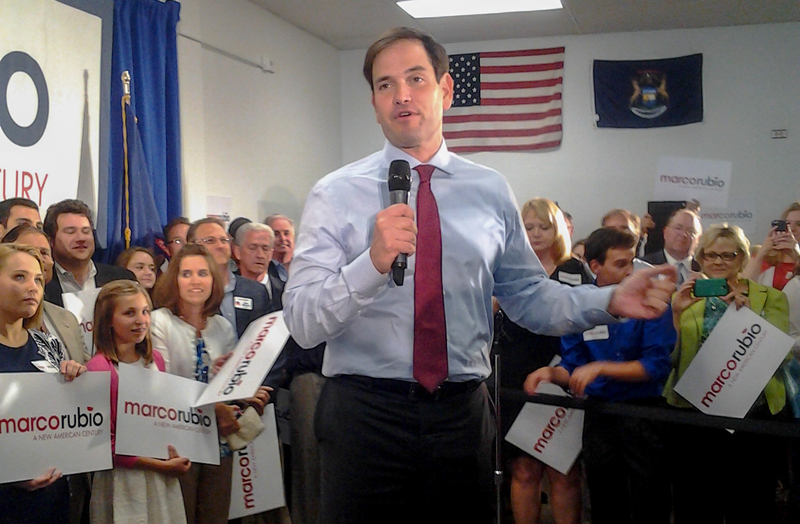 Last week, I stretched a bit and traveled downstate to Livonia and attended a rally for Marco Rublo. I came away convinced that if he becomes the face of the Republican Party we can beat even the developing Biden-Warren ticket (Sweet Joe and Redistributor-in-chief Rebecca), let alone the duplicitous duo of Hillary and Bill. Marco Rubio has a great back story, as the son of immigrants who worked as a maid (mother) and bartender (father) in Florida where he was born. He is articulate and has fire in his belly…and it shows on the stump. He is right on most of the issues. He will emphasize a change in American emphasis from showering dollars on overpriced academic programs to vocational goals, both at the high school and college level. He opposes the badly-negotiated Iran deal. He is right to life. He stresses balanced budgets. In short, he believes as we do. But importantly, he is capable of delivering this with a smile. His overflow crowd at the Livonia GOP headquarters was made up of at least 50% young people. He won’t alienate the independents, he will draw them in. He is serious without projecting anger. Yes, we have about a dozen really good candidates, but if we are smart, we will try to sort out which one is both conservative AND electable. I spent a little time and decided it can be Marco Rubio. ← Skewed priorities and reading between the lines. RINO Rubio from the John McRINO and Lindsey Grahamnesty led Gang of Eight? BWAAAHAHAHAHAHAHAHAHAHA! Do us all a favor and quit Hispandering. Marco Sanctuary City Gang of 8 Rubio? No thank you.